Food Sovereignty was born as an international concept – as a response to corporate led globalization, and the negotiation of food and agricultural trade through the WTO. 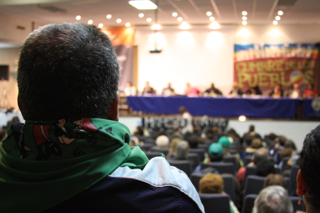 It is a term coined by members of La Via Campesina, the international movement of small farmers and landless peoples (http://viacampesina.org/en/) . It has grown to become a framework which can connect the local to the global and is a point of reference for many critics of the neoliberal and corporate controlled financial market based model of economic and social development. Food Sovereignty is supported by community groups, farmers organisations, consumers groups, environmental organisations, development organisations, grassroots activists and many many more people around the world. Internationally, La Via Campesina alone represents over 300 million farmers, and has 148 member organizations in 69 countries. what does food sovereignty mean? why is it relevant for ireland? Ireland has a strong agricultural sector, which in spite of falling farm incomes is still tied into a market logic of exports and world market prices. Farmers have lost more and more autonomy and farm subsidies support food for industry and export instead of food production for communities. Increasingly Irish land is not used to maximise the wellbeing of Irish citizens and the our shared natural environment, but to meet the demands of food corporations and processors. Food Sovereignty means reappraising how we as a people want our food and agriculture systems to function, developing spaces for long term economic and social collaboration between rural and urban areas, and protecting land, agriculture and food from corporate takeover. Food Sovereignty first and foremost values food producers within society. It aims to protect and promote agroecological, small scale and localized food production and processing systems, including artisan fisheries. 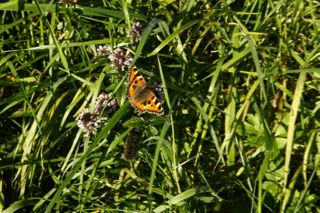 A food sovereignty framework for Irish food, agricultural and fisheries policy would mean increased public support for developing alternative distribution systems, helping farmers become established and find markets for their produce, and an increasing focus on promoting low or zero input farming systems which nurture biodiversity and provide multiple social and economic benefits to the rural and regional economy. 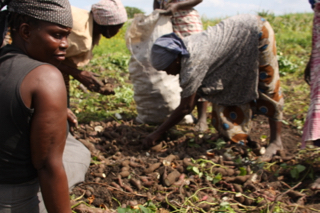 It is essential that farmers can receive a fair price for their products and ensure a livelihood for themselves. Food sovereignty also promotes access to land for young farmers and the landless. A food sovereignty framework for Irish farming would also mean support for Food Sovereignty in developing countries. Food sovereignty offers a clear solution to world hunger through supporting the work of small farmers, fisherfolk, pastoralists, indigenous peoples. Food sovereignty implies a right and a responsibility – the right to protect ones own markets from low cost imports, and the responsibility to not dump low cost goods in other markets at the expense of producers there. Irish exports to developing countries can damage the potential for local markets to develop in those countries, as local producers struggle to compete with low-priced imports. As long as agricultural trade continues to be negotiated within the WTO, these imbalances will continue. Food sovereignty demands a democratic framework for negotiating agricultural trade which puts people, not corporations at the centre. A Food Sovereignty framework implies the use of agro-ecological farming systems – based on low to zero inputs and high levels of soil conservation, biodiversity promotion and the use of locally adapted and reproducible plant varieties. Producing, processing and distributing food locally as opposed to globally means more resilient and sustainable food systems, which require less fossil fuel based inputs. Food sovereignty in Ireland would mean huge decreases in fertiliser, pesticide and antibiotic use, increased numbers of mixed farms, agroforestry and other initiatives, as well as increased agricultural and non cultivated biodiversity, with the subsequent benefits to flora and fauna. As the food sovereignty framework offers an alternative to corporate led globalization of food and agricultural production, it provides a vital tool to help communities draw the links between nature, health, human survival and livelihoods, while helping to educate citizens in the political and economic impacts of the food system at a local and global level. Food sovereignty also implies a rejection of patriarchy. It means greater support for youth participation and for the community as active participant in contesting policy formulation and development. Food offers a direct point of entry for understanding the economic, social and political relationships which sustain the existing corporate and financial market model of today’s society. Europe’s Common Agricultural Policy (CAP) is Europe’s biggest and most heavily funded common legislation, accounting for over half of the EU budget. 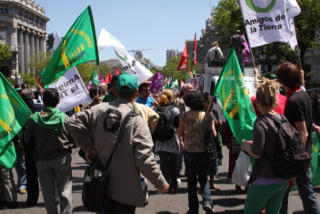 The European Coordination Via Campesina (ECVC) (http://www.eurovia.org/?lang=en​) is the European branch of La Via Campesina which supports a Food Sovereignty framework for the CAP. ECVC currently has no Irish member organization. As well as this there is a growing movement based around the Nyéléni Europe Movement for Food Sovereignty, in which some Irish organizations have participated. There is also a broad group of organizations which work for a CAP based on Food Sovereignty, known as “FoodSov CAP”. They produce policy documents and proposals to the European institutions based on Food Sovereignty. The Nyeleni Europe Conference in Austria in August 2011 brought together more than 400 people from 34 European countries to discuss how to move build and strengthen a Food Sovereignty movement in Europe. The participants agreed on a declaration which is available on the Nyeleni Europe website – www.nyelenieurope.net. They also agreed to develop a plan of action for moving forward – first to Resist, then to Build, and Finally to Transform the political, economic and social relationships around food and agricultural production at a local, regional and European level.